Garbage disposals are a plumbing asset that many homeowners fail to properly care for. When garbage disposals aren’t properly maintenanced, they can become an expensive repair down the road.The best way to avoid clogs and other garbage disposal problems is by regularly maintaining and cleaning your disposal unit. 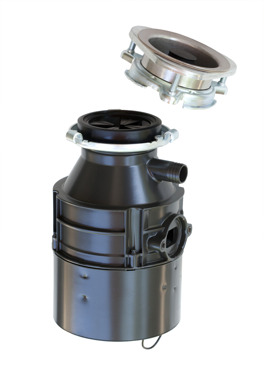 With proactive garbage disposal care, your unit can perform effectively for years without needing repairs or replacing. ALWAYS turn off or disconnect the power to your garbage disposal before cleaning. Normally, you just need to unplug the unit from under the sink. If you can’t locate the outlet, cut the electricity to the circuit breaker powering the garbage disposal. Never stick your bare hands down the drain. Use an extended cable or a sink auger to help break up and remove the obstruction. Don’t wait for your garbage disposal to start smelling bad before finally deciding to clean it. Perform routine flushes by allowing a thick stream of hot water run down the drains for one minute. This helps reduce and remove any odors. There are many non-hazardous ways you can clean your garbage disposal and remove any odors. It’s recommended that you avoid using chemical drain cleaners since they can corrode and weaken the integrity of your pipes. These are some of the most effective ways to eliminate odors coming from your garbage disposal using products found at home. Baking soda and vinegar- The acidity from the baking soda and vinegar solution is great for killing bacteria, including salmonella and E.coli. Pour a ½ cup of baking soda and vinegar down the drain and let the combination fizz for about 15 minutes. You can use the sink stopper to keep the solution inside the disposal. Wash away the solution by running hot water down the garbage disposal for one minute. Citrus- Putting citrus peels down your garbage disposal is a popular and fresh way to combat any foul odors. While the peels don’t do much in the way of cleaning, the citrus oils produce a pleasant fragrance that wafts throughout the kitchen. Ice and Rock Salt- Eliminating odors with this method requires you have the power connected to your garbage disposal. Before performing any further cleaning, make sure to shut off the power to your disposal unit again. Drop a dozen or so ice cubes down the drain and then pour a cup of rock salt. Turn the garbages disposal on while running the water. Leave both on for a minute until the ice and salt have scraped away and dislodged any buildup. Your garbage disposal is a useful and handy tool that needs proper care and regular cleaning maintenance. Bacteria sitting in your unit from all the food products thrown down the drain will start to create horrible odors. Regularly cleaning your drains is an important step to preventing it— whether by cleaning drains with safe products or hiring a professional plumbing company to perform hydro-jetting services on your entire plumbing system. Express Sewer employees are highly trained plumbers that can clean your drains safely and efficiently. Our company is fully licensed and insured and will provide you with a free estimate on your garbage disposal cleaning needs! Contact a representative to learn more about our extensive list of plumbing services!